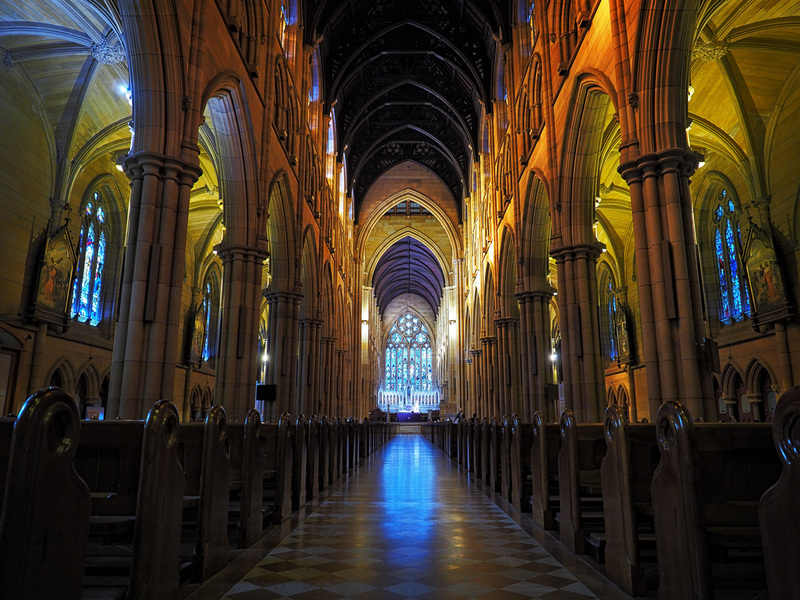 Saint Marys Cathedral, Sydney. Shot with Olympus OM-D E-M5Mkll, Olympus 12-40mm f2.8, 12mm @f2.8, ISO 640, 1/13sec Handheld. Other than the stunning looks of the silver edition Olympus OM-D E-M5Mkll the first feature to impress me was the sound of the mechanical shutter. I have been shooting with the OMD’s, E-M5 and E-M1, for about a year and a half now and have come accustom to sound of these mirrorless cameras. So when I fired up the newly realeased E-M5Mkll I thought the good folks at Olympus must have enabled the silent mode on this camera. No word of a lie it is very very quiet. There is a sound to be heard but it’s like the sound of a butterfly’s wing hitting a tissue……… Ok maybe I’m exaggerating here a bit, but it bloody quiet. Roaming around the Saint Mary’s Cathedral, Sydney I could take as many shots as I like knowingly that I wouldn’t be disturbing the patrons with the sound of the camera firing off shots. It does have an electronic shutter mode that doesn’t make a sound at all but I can’t see me using this as I more than happy with the minimal noise of the mechanical shutter. 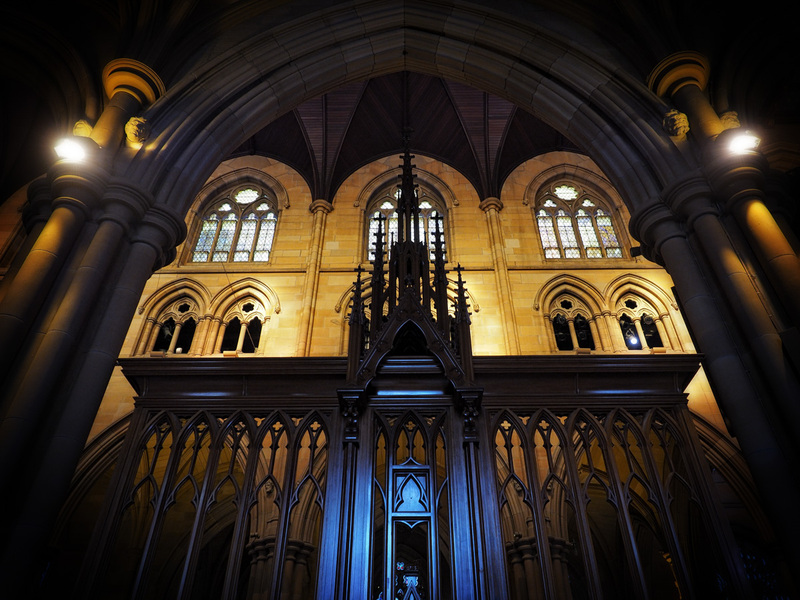 Saint Marys Cathedral, Sydney. Shot with Olympus OM-D E-M5Mkll, 12-40mm f2.8, 12mm @ f2.8, ISO 640, 1/50sec, Handheld. 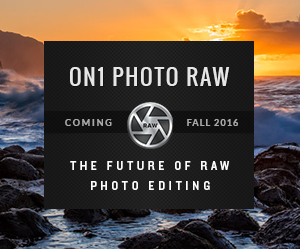 As Adobe hasn’t released their update for this camera, I had to edit the RAW files in the supplied Olympus Viewer 3 software. So these images didn’t touch any of the Adobe products for photo editing. Once the RAW files were tweaked and then saved as a 16bit Tiff, I then stylised them in my favourite photography editor onOne Software. Then I added the keepers to my Lightroom library. I look forward to seeing more of your shots with the MkII. Thanks Nathan. It’s so whisper quiet 🙂 I’ll have to look into the Cactus V6 triggers. I moved from Nikon to Oly and have an SB-700 flash so it might get some use. Thanks for the tip off. What are you shooting this weekend? Yeah the great thing about the Cactus triggers is that they work with any model of flash/camera. This weekend I’ll be shooting product and lifestyle images for a local company up here in Central Queensland that sell specialised cooking equipment for camping. The joys of mixing passion and paid work. I hope all goes well for you mate.